Home Dell's Friends	Craigslist Chandelier! Major Score! Happy Tuesday, Friends! It’s a beautiful day and today I’m pleased to share with you some sparkly goodness my sister-in-law, Shana, recently found on Craigslist! Hoorah!!! My family shares with me a love of crystal chandeliers. Even my husband has come over to the dark side when it comes to chandeliers. Case in point he bought me this massive ceiling medallion for Christmas this past year despite the fact we won’t hang it in this house since we are moving soon. He knew how much I loved it. Isn’t it dreamy? It’s made of tin like the old ceiling tin tiles of yesteryear. There is a hole in the middle for a chandelier chain. The piece is about 3 feet in diameter. It really makes my heart sing! Up close. Those details! Ahhh…. Long story short, Shana quickly snatched up the chandelier. And what a great buy! She bought it and hired an electrician to hang the fixture the very next day. Time for musical chandeliers! 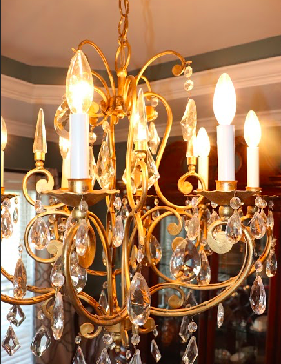 I also love there are different sizes and shapes of crystals on this fixture. Personally, when I am making over a chandelier I like to mix the shapes too, just to make it more unique and interesting. Notice the glass spires? Gorgeous! I wonder if this was a trend 70 years ago? Hmmm. Must research! The chandelier is even beautiful when it’s not lit. Wisely, Shana had the electrician put the light on a dimmer switch making it easy to adjust the lighting and the mood!